People enjoying the New York State Fair in Syracuse, New York. 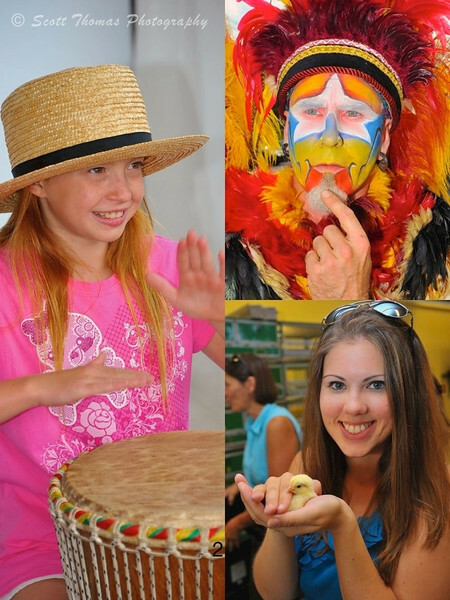 Here are some people enjoying the 2011 New York State Fair. From left: The girl with the drum was getting a free lesson at the Pan African Village, the brightly colored fellow is the Gatekeeper of an entertainment troop called Dragon Knights who was very curious about my camera and the young woman holding the baby chick in the 4-H building is my daughter. I have photos of one or both of my daughters holding baby chicks going back years. A real tradition for us. All photos were taken with a Nikon D700 camera, Nikon 28-300mm f/3.5-5.6 AF-S FX VR lens and Nikon SB-600 Speedlight. This entry was posted in People and tagged 28-300mm, baby, chicken, costume, dragon knights, drum, entertainer, girl, holding, instrument, makeup, new york, New York State Fair, nikon D700, playing, syracuse, vr, woman. Bookmark the permalink. Sweet children, colorful people and beautiful chicks. You cant fail with these motives subjects. btw, it seems as if your pictures are slightly more saturated lately. I like it! Love the photo of your daughter. Thanks, Karma! She humors me these sappy family traditions. I wouldn’t call them “fair”, I’d call them quite good! 😉 Nice portraits, Scott! Thank you, Barbara! You should make a trip up to the Fair one of these years. People are just so happy at the Fair. Even if they are working. Thanks, Nye! Remember to keep your flash handy on those bright sunny days. Scott, the concept of flash and bright sunny day seems so odd to me, but it does work for portrait. Is it just me or does the guy resemble Will Ferrell? LOL! And by that association former President George W. Bush who Will Ferrell played often on SNL. I’ve had a few people mention the characters likeness to Mr. Ferrell. Though it would be something he would probably enjoy doing. Perhaps, Kathy. It’s more like Street Photography in style. I lump it into Event Photography as they are like candids from weddings, parties, etc. I will have more coming after this weekend…stand by! People are usually not on their guard as much at the Fair. In fact, many want to be photographed doing things out of the ordinary. I like photos such as yours catching folks being who they are. The colors are fantastic.